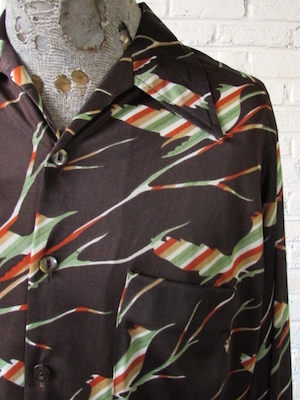 Home > Men's Vintage Shirts > All Men's Vintage Shirts > (L,Tall) Vintage Mens 70s Disco Shirt! Birds Camouflaged in Stripes on Brown! Mens vintage 1970s disco shirt. This funkadelic shirt has a brown base with silhouettes of birds sitting in branches covered in white, green, orange and ochre stripes. Has a super wide & pointy disco era collar. Closes in the front with pearly brown buttons with one matching buttons on each cuff. One pocket on the chest. One pocket on the chest. Shirt has a tapered hem. Tagged by M Hyman & Son. 100% Nylon.